HOPE’s Final Distribution Of Urea To The Selected 16 Poor Farmers Of Sujawal. 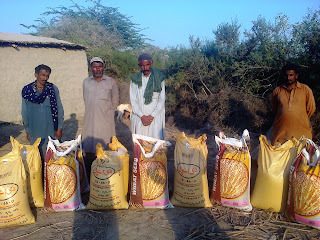 To 16 small landowners of Sujawal economically handicapped in cultivating their lands on their own, high quality wheat seeds have been provided with other technical assistance so that they become capable once again to earn their own livelihoods independantly. 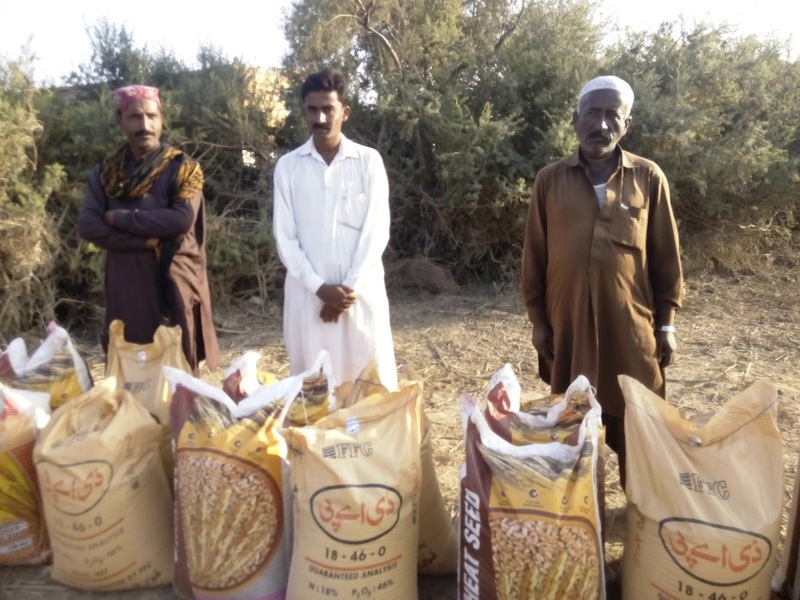 As a last phase of assistance to these 16 poor farmers of Sujawal, urea was provided right on time of their need before their lands were watered again so that full benefit of the whole process of cultivation could be achieved with optimum results. The whole process is now complete and only the taking care of the lands and timely watering of the fields remain. The wait will be for another 10 weeks before the crop matures for cutting. Chairperson of HOPE, Dr Mubina, a child specialist in Karachi will oversee the complete management and has accordingly instructed the administrative staff of HOPE in Badin and Sujawal. Chairperson of HOPE, Dr Mubina, a child specialist in Karachi, will be responsible for providing directives and instructions based on the master-plan worked out in advance. And using its offices in Sujawal and Badin the administrative team will ensure a smooth running of the whole project to be able to produce the best possible results. HOPE’s Darood-o-Millad Mehfil On 18th Dec, 2015. The day is celebrated to mark the beginning of the birth-month of the Holy Prophet of Islam. At HOPE’s main office all colleagues from the various centers of HOPE such as Zia Cilony Hospital and School and Gurumandir Hospital and PUR water personnel were invited over to attend the occasion. HOPE’s women employees and friends of all the centers were well prepared with Naats and other materials for recitation and they had plenty of support and appreciation from a substantial gathering at HOPE’s head office. HOPE, an educational NGO in Pakistan made all seating and audio arrangements for the occasion. Naat and Durood was recited in remembrance of the life of Holy Prophet (SAW) and his Sunnahs were presented. After the millad all participants and everyone else present were offered snacks such as samosas, sweets and refreshments. As always particular attention was given by Dr MubinaAgboatwalla, child specialist in Karachi, in the arrangement and preparation of the whole occasion. 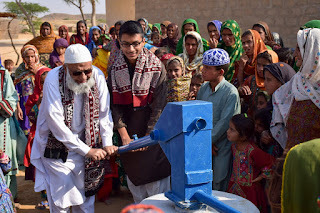 HOPE’s Youth Wing From USA visited Karachi To Review Hand Pumps Installed With Their Support. 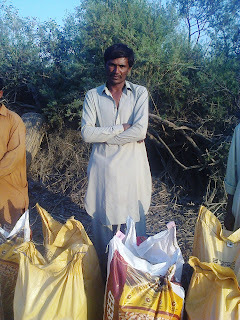 HOPE, an educational NGO in Pakistan , has been helping the needy of rural Sindh to obtain clean drinking water . Water is the single most important nutrient of life.Without water life simply is unsustainable. And although potable, drinking water fit for human consumption is plentiful in many countries and regions of the world, it is either not available or very scarce in other parts of this planet. 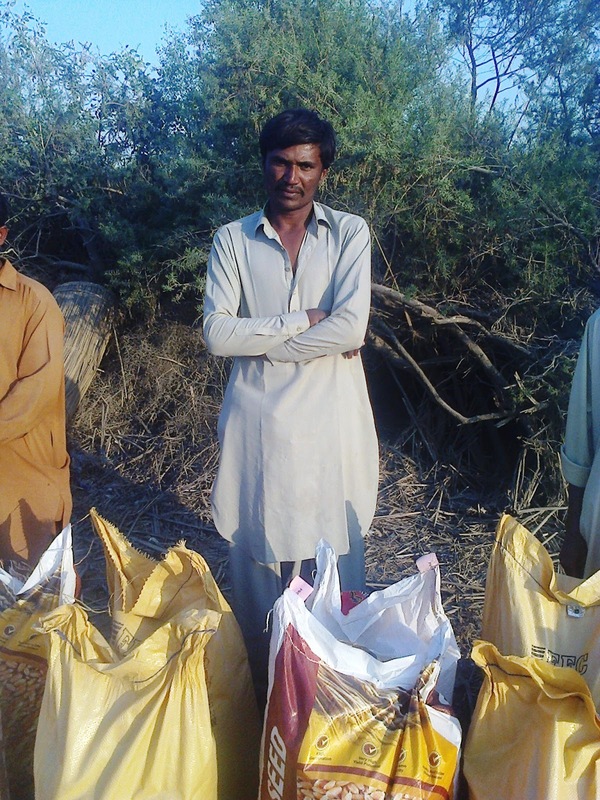 The province of Sindh in Pakistan happens to be one of the places where water is chronically short besides being dirty and contaminated. In this regard HOPE’s youth wing in the US focused their efforts amongst other youth groups and students providing them full awareness of the non-availability of drinking water in rural Sind . 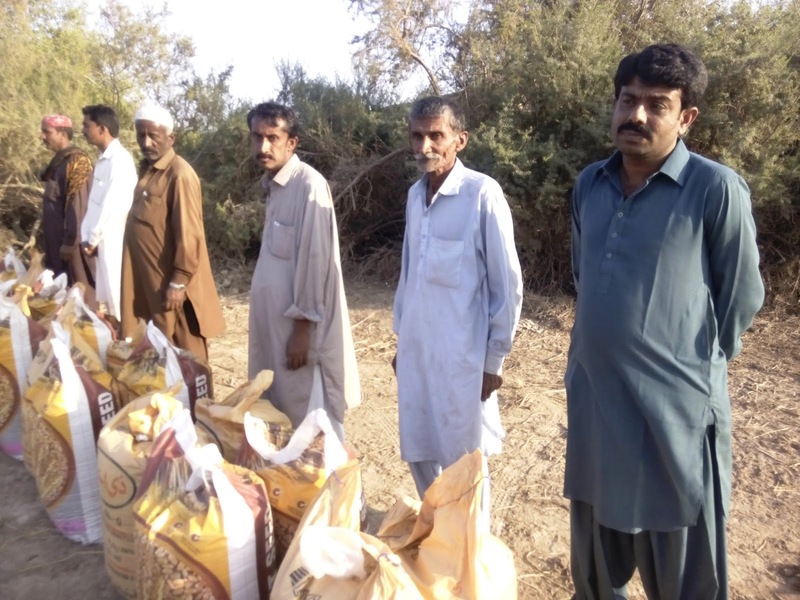 This resulted in the formation of a support group eager to provide financial support for installation of hand pumps in selected areas in dire need of water. 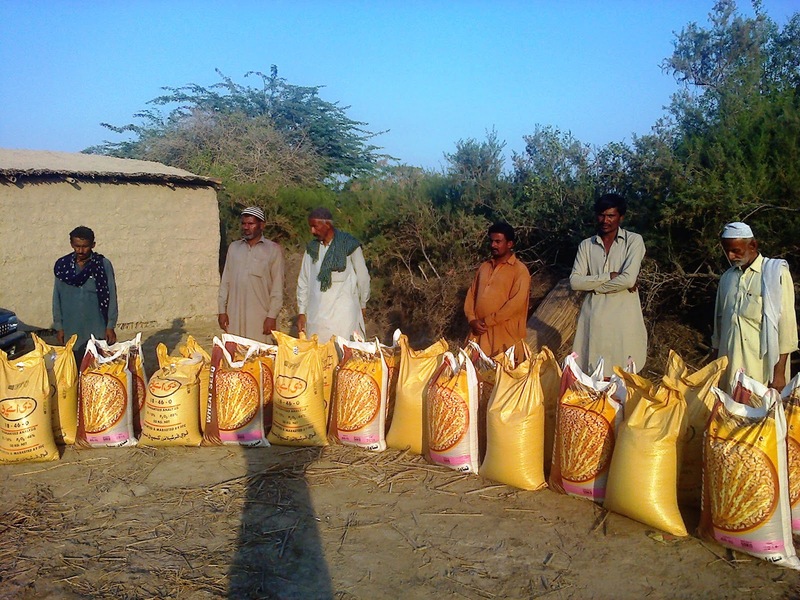 HOPE, a health NGO in Pakistan, was entrusted in selecting the populated areas in extreme need on drinking water. Three such places for setting up the hand pumps were selected and hand pumps were successfully installed. As usual, and as already known to the HOPE team from experience, the hand pumps required deep drilling beyond 200 feet to reach the subterranean water. This is also necessary to maintain continous flow of water at all times. Members of HOPE’s Youth Wing based in the US visited Pakistan to view and inspect these hand pumps in person and advise their friends and colleagues in the US of the quality of pumps, the places selected and also the benefits derived from this activity. They were not disappointed. In fact they were very happy to note that their efforts had produced such positive results and was assisting whole communities. b} Wazir Ibrahim Goth : approximately same distance as Faiz Muhammad Goth but more towards north east of the city center with approximately 55 families residing in this village. 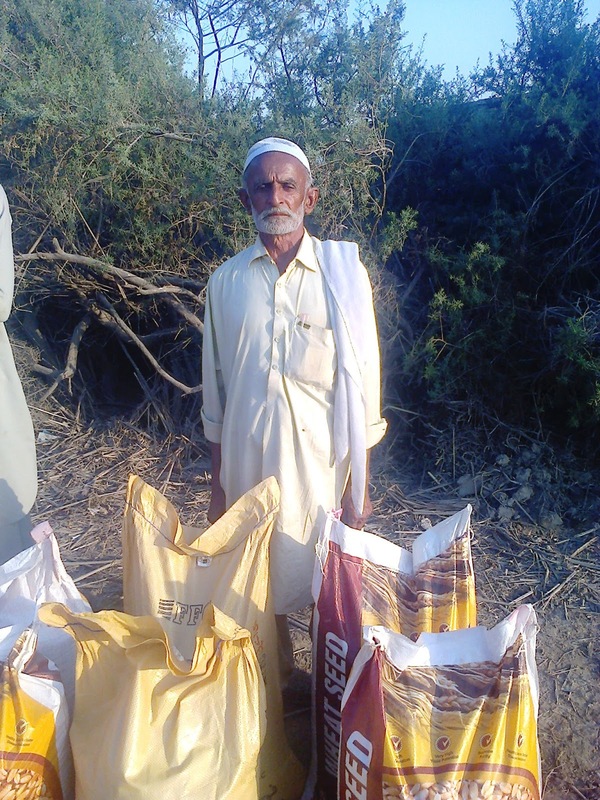 c} Ramazan Haidery Goth: approximately 60 kilometers from Karachi with 60 families residing in this goth/village. HOPE’s US youth wing’s representative Mr Ayman was accompanied by his younger brother and also their uncle and grandfather. 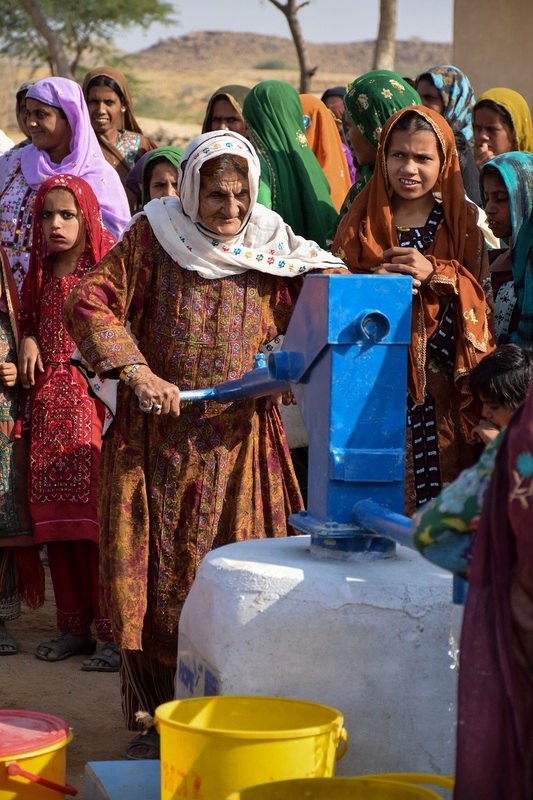 All of them were extremely overjoyed to see how their support had benefitted all the three communities – especially with the fact that installation of these pumps saved these communities from migrating to areas with better accessibility to water. As always particular attention was given by Dr MubinaAgboatwalla, child specialist in Karachi, in the selection of the sites for the pumps. 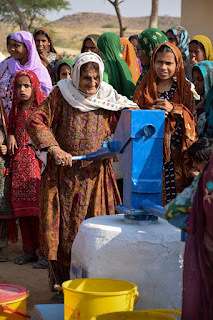 Quality and material of the hand-pumps is also closely checked by Dr MubinaAgboatwalla, child specialist in Karachi. The water being extracted by hand pumps so far installed is potable and fit for human consumption. 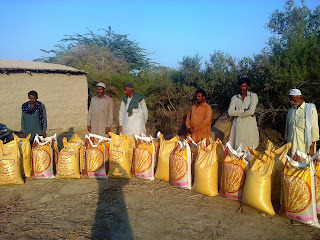 HOPE’s Distribution Of Wheat Seeds To The Very Poor, Flood Affected Farmers Of Sujawal. HOPE, an educational and health NGO in Pakistan , organized a one day orientation on Routine Immunization at HOPE/Mchip Office, District Sanghar. The activity began with recitation of the verses of Holy Quran .After which Dr.Muzaffer Samoo Acting District Coordinator MCHIP, began with welcome remarks and talked about the Genesis of this Routine Immunization Orientation. Dr. MuzafferHussainSamoo Acting District Coordinator MCHIP briefed following points/Agenda for this orientation. Define supportive supervision and discuss its role in improving immunization services. Outline major steps essential to supportive supervision. MNCH Services Component 2 of USAID/Pakistan’s Maternal and Child Health (MCH) Program implemented by MCHIP/Jhpiego in USAID target districts in Sindh is contributing to achieve improvement in maternal and newborn health through improved quality of MNCH service delivery. One of the objectives of program is to promote routine immunization and enhance immunization coverage and quality among target population through adopting modified “Reach Every Union Strategy”, strengthen linkages between Expanded Program on Immunization (EPI), Lady Health Worker (LHW) Program, stake holders like Peoples Primary Healthcare Initiative (PPHI) and partners (WHO, UNICEF etc) and enhance coverage through registering the target population in selected districts. In current year MCHIP is planning to improve quality and coverage of immunization of target population (Children 0-23 months, pregnant women and Child Bearing age women) in all USAID focus districts mainly through registering and vaccination in target population. This orientation/training of routine immunization in districtSangharMCHIP/Jhpiego monitoring teams with immunization protocols, guidelines, vaccination schedule, cold chain and assessment of immunization services provided at health facilities. The manual will enable the team to conduct a purposeful supervision of the vaccinators and EPI services provided at health facilities. Mr. LalaAftab Immunization Officer briefed that Immunization is a very successful and cost effective public health intervention to protect human from infectious disease. Over the time it has been learned that immunity is best achieved by introducing vaccine at certain age against particular disease for life long duration. Vaccination stimulates body’s own immune (defence) mechanism against vaccine preventable disease, annually millions of children and women are saved through vaccination. This Program aims to reduce infant mortality and morbidity by immunizing children against poliomyelitis, tuberculosis, diphtheria, pertussis, tetanus, measles, hepatitis B, pneumonia, meningitis, and haemophilus influenza type B. It also vaccinates pregnant women to protect them from tetanus toxoid and their fetuses from neonatal tetanus. Government of Pakistan provides free of cost vaccination against vaccine preventable diseases through static EPI centers, vaccination outreach sessions, mobile vaccination units and vaccination campaigns. Inactivated vaccine contains inactivated, but previously virulent, micro-organisms that have been destroyed with chemicals, heat, radiation, or antibiotics for examples Cholera, influenza etc. Vaccines contain live, attenuated vaccine is cultivated under conditions that disable their virulent properties, to produce a broad immune response are for example measles, rubella and mumps. Toxoid vaccine is made from inactivated toxic compounds, for example tetanus and diphtheria. *Note: IPV will be administered at 14 weeks with third dose or before the age of 12 months to all the children. Vaccination of child starts at the birth and completes at first birthday. However; additional doses of vaccination against Polio lasts at five years of age. Mr. LalaAftab briefed that Pregnant mothers and child bearing age women are at risk of being exposed to tetanus an infection caused by Clostridium Tetani during the process of delivery. The purpose of immunization is to protect women of child bearing age and pregnant women from tetanus and to protect their newborns against neonatal tetanus. In case of neonatal tetanus is identified, administer one dose of TT vaccine as soon as possible to mother and treat baby as per guidelines. Then facilitatorMr. LalaAftabimmunization officer JSI/MCHIPvisited Civil Hospital Sangharalongwith our 04 Supervisors, 03 Clinical Officers& Sr. Clinical Supervisors. Mr. LalaAftabhave assigned different tasks to the participants for check list and have also trained them regarding the process of this immunization handling and storage. Supplementary Immunization Activities (SIAs) are additional immunization campaigns conducted to interrupt the transmission of disease; mostly these refer to intersect the circulation of wild polio virus. SIAs include National Immunization Days (NIDs) and Sub-National Immunization Days (SNIDs) target Polio in general. NIDs are conducted in line with the global immunization policies and recommendation of international Polio Technical Advisory Group (TAG) by government of Pakistan to target high risk, poor performing districts with low routine immunization coverage. In case of disease or case outbreak, crash immunization campaigns are also launched in high risk areas against single disease for example Measles vaccination during Measles outbreak. He also briefed that vaccines are sensitive biological products which may become less effective, or even destroyed, when exposed to temperatures outside the recommended range. Vaccines exposed to temperatures above or below the recommended temperature range experience some loss of potency with each episode of exposure. Repetitive exposure to heat episodes results in a cumulative loss of potency that is not reversible. “Cold chain” refers to the process used to maintain optimal conditions during the transport, storage, and handling of vaccines, starting at the manufacturer and ending with the administration of the vaccine to the client. The optimum temperature for refrigerated vaccines is between 2 to 8 degree Celsius. In addition, protection from exposure to light or direct sun light is a necessary condition for vaccines. Temperature monitoring chart is available at almost all EPI Centers and is maintained by vaccinator. Vaccinators are required to record the inside temperature of refrigerator atleast twice each day and record it in the chart. All supervisors must check the temperature monitoring record and compare the latest reading on chart with the thermometer. Cold Box Cold box are insulated containers that can be lined with coolant packs to keep vaccines and diluents cold during transportation, these are also used to store vaccines temporarily when the refrigerator is out of order or being defrosted. Vaccine Carrier Vaccine carriers are insulated containers that, when lined with coolant packs, keep vaccines and diluents cold during transportation. They are smaller than cold boxes and are easier to carry during outreach activities. Ice packs Ice Packs are used to maintain the temperature inside vaccine carrier to desired limits. Ice packs must be freeze, the freezing status can be checked by shaking the pack near ear, in freezed pack there will be no sound. Micro plan Written information of district/Union Council, population, target population (no of children and pregnant women residing in area), no of villages, population of each village, visit schedule of vaccinators. Adverse Events following Immunization (AEFI): An adverse event is any unwanted medical reaction in a patient who has been administered a medicine or vaccine. An adverse event is any unfavorable and unintended symptom, disease or sign (for example, an abnormal laboratory finding), associated with the use of the medicine or vaccine. The medicine or vaccine does not necessarily have to have caused the adverse event. Fever, pain or swelling at the site of injection, anaphylaxis (very rare) are few examples of AEFI. Static Centre EPI Centre established within health facility. Vaccine Vial Monitor (VVM) A vaccine vial monitor (VVM) is a thermochromic label containing heat sensitive material which is placed on a vaccine vial to register cumulative heat exposure over time. The combined effects of time and temperature cause the inner square of the VVM to darken, gradually and irreversibly. A direct relationship exists between the rate of color change and temperature. Ice Lined Refrigerator (ILR) IRLs are specific refrigeration equipment designed to maintain a cabinet temperature between +2 to + 8 Degree Centigrade and are used to store vaccines. ILRs are so designed with an ice bank (Icepack lining) which keeps the internal temperature at a safe level despite electricity failure. Temperature Chart Charts displayed at the vaccine refrigerators with hourly recording of temperature. The temperature written at chart and the dial thermometer must be matched at the time of supervision. Dial Thermometer A thermometer is an instrument for monitoring the temperature of cold chain equipment like refrigerator, cold box or vaccine carrier. It enables to adjust the temperature to the correct range for the storage and transport of vaccines. Tally Sheet Tally sheets are forms on which health workers make a mark every time they administer a vaccination. These are used as a basis for reporting to the district level. Supervisors use them to monitor the accuracy of reporting from health facilities to districts. As always particular attention was given by Dr Mubina Agboatwalla, Chairperson of HOPE and child specialist in Karachi, who closely monitored the preparation and execution of this activity. Dr Mubina Agboatwalla, Chairperson of HOPE and child specialist in Karachi ensured that all participants benefitted from it and became capable enough to replicate it with the working skilled birth attendants and other lady health workers.